When you’re EDITING, you can make good decisions just watching the Canvas Window on your laptop. But for color grading, it’s critically important to watch your show on a monitor that’s displaying an accurate image. Monitoring is important because all your color grading work is going to be off if the monitor you’re watching while you work is not telling the truth. Think of all the ways viewers might watch your project. If you’re delivering on DVD, your show might be watched on plasma or LCD TVs, projectors, or older CRT TVs – but they also might be watching the DVD on a desktop or laptop computer. If you’re delivering via the internet, your viewers will almost all be watching computer screens. But, some might be watching on a television connected to an AppleTV or other set-top box. Then don’t forget video iPods, iPhones, cel phones and all other portable video playback devices. How do I design an accurate monitoring system when viewers screens vary so much? The simple answer is that all these viewer’s screens are designed to make high end content, like Hollywood movies and broadcast television shows, look as good as possible. And every colorist working on a professionally-produced show watches a monitor calibrated to the same industry standard. If you went to a dozen top colorist’s suites, borrowed their monitors, and stacked them up in a video wall, you’d see many different brands and sizes, but the video image would look identical. So, if YOU color grade your show while watching a monitor calibrated to the industry standard, and it looks good to you, it really has the best chance of looking good to the vast majority of your audience. What is the ideal monitoring environment? Your monitoring environment is also important. Ideally, your walls are a neutral gray, lighting is neutral, on the dim side better than too bright, but not pitch black, with no glare on your monitor. That red wall might look cool to clients but your monitor will look turquoise in comparison so all your color grading will be off. Accurate brightness is important. Obviously, if your monitor is brighter than average, you’re going to color grade your show too dark. If your monitor is dark, your show will end up looking washed out. 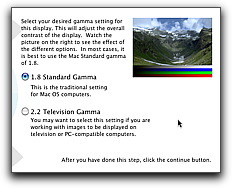 Power Tip: Macs use a gamma of 1.8. This is a little brighter than the 2.2 gamma of Windows computers. If you want to see how your video might look on a Windows computer, under the Blue Apple menu, go to System Preferences > Displays, then click Calibrate. This’ll launch the Display Calibrator Assistant. If you leave Expert Mode off for now, and click Continue, here you can switch back and forth between 1.8 and 2.2 gamma settings. These two images approximate the two different gamma settings. Notice that highlights and blacks are the same. But midtones get darker, and very dark tones get crushed to black sooner at a 2.2 gamma. So, the midtones of your project will look a little darker on Windows computers, and a little brighter on Macs. Power Tip: If your project will mostly be played on PCs, you’ll want to color grade shadow areas to appear a little light. If we Go Back and turn Expert Mode on, then click Continue 6 times, we’ll get a continuous slider that can adjust gamma from 1.0 up to about 2.6. If your project will be watched on PCs and Macs, and looks good anywhere on the range from 1.8 to about 2.6 you’ve done an excellent job both shooting and lighting, and color grading! Obvously, it’s important your monitor shows accurate hue and saturation, and is not shifting colors in any direction, or making colors look too vivid or too pastel. For an example, if your monitor has a bluish tint you’ll be overcompensating and pulling the blues out of shots so that skies and oceans’ll have a drab, greyish look. We don’t want to do that! It has been agreed by many folks in lab coats that sunlight, at noon, on a perfect day, has a color temperature of around 6500 degrees Kelvin. So, 6500 Kelvin has been chosen as pure white in many standards- NTSC, PAL, High Definition television, DVDs, computer displays, web graphics, and digital cameras, just to name a few examples. So 6500, also called “D65”, is here to stay as the standard white reference point for displays. If we go back to our Display Calibrator Assistant and click Continue, we’ll be on the “Select a target white point” page. You definitely want to work set to D65, but it’s a good idea to periodically check your work at color temperatures ranging from 5000, also called “D50”, sometimes used in photography or desktop publishing, all the way up to 9300, which is how pure white looked back in the day on old CRT TV sets. How can I check my work at different white point settings? Under the View menu, under Video Playback, choose “Digital Cinema Desktop Preview – Main” as the monitor destination. Then, choose View > “External Video” > “All Frames”. Now, you’re looking at a single frame at the standard D65 white point. You can press space bar to start and stop playback if you want. 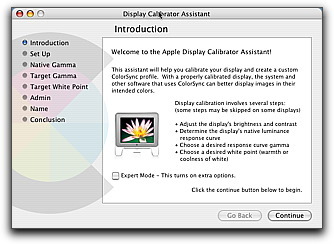 Now switch back to the Display Calibrator Assistant and change the white point. Switch back to Final Cut and you’ll see how your picture might look on a warmish monitor or older TV. How do I tell how accurate my computer monitor is in terms of color and contrast? If you click through the first few screens of the Display Calibrator Assistant, you can just make an initial judgment about whether your monitor seems to be already calibrated fairly well, by just tweaking the controls a little to see if you can make an instant improvement. If you try a quick test and it’s obvious you can improve the accuracy of your monitor from the current setting, then, I would recommend going through the whole calibration procedure so that the characteristics of your monitor match generally accepted norms. You’ll probably want to go through this procedure a few times, save all your custom profiles, then do some subsequent tests to choose the best one, so this’ll take a while- but if you’re using your computer monitor to judge you video image, and want your stuff to look great, it’s worth it! If your project will be watched on computers, the only way to see exactly what the final picture will look like is to encode it to the final format, whether that’s FLV, H.264, or whatever. But that test will take a long time! So, to see how your final video will look on several computer screens, set an in and out point on your timeline just a couple frames apart, then export a test movie with the settings you’ll use for your final project. This will be quick because it’s only a few frames. Then drag the movie to a browser or iTunes. Then, check out the frame with different gammas and white points. Using this as a reference, you’ll be able to make better decisions when color grading your project. For example, if your movie looks too dark at the higher gamma settings, you’ll want to grade it brighter. If you’re a little intimidated by the variance in color and contrast, don’t worry- once you’ve gone through the rest of this course and become a color expert you’ll be surprised at how well your color-graded picture holds up on a wide variety of gamma values and white points. Last Resort Tip: Remember that you can apply an overall correction to your whole project upon export or while encoding. So if you find your whole project is playing with, say, too soft contrast, you can do a final contrast tweak in a nested sequence or in Compressor or another encoding tool. This is a last resort, but could come in handy if you have to meet a deadline. There are several temporal, meaning time-related, aspects of the video picture. It’s important to know if you’re seeing the field and frame rate, and motion blur of your picture the way your viewer will see it. We’ll look over several monitoring options and see which ones show motion accurately. A video image is made of rows of dots called pixels. DV footage is 720 pixels wide by 480 pixels high. HDV footage is 1440 pixels wide by 1080 pixels high. When you are monitoring pixel-for-pixel, it means you are seeing one pixel on your monitor for every pixel in your footage. The image is not being scaled up, down, or stretched to correct the aspect ratio. Pixel-for-pixel monitoring is not all that important for color correction, but it is very important for compositing, keying, motion graphics and other visual effects, so if you’re buying a monitor, consider that if you shoot greenscreen or do a lot of motion graphics or CG work. How do I calibrate a professional monitor? There are many step-by-step instructions on the web. Now, let’s review some monitoring options. The Canvas Window is your monitor of last resort. It displays a low quality, “proxy” image of your timeline, and changes appearance in unpredictable ways based on many factors, like how your timeline is set up and what kind of clip is currently playing, or what filters are applied. In other words, the Canvas is NOT a reliable monitor to watch while color grading. The only good thing about the Canvas, other than coming free with Final Cut, is that you’ll sometimes get higher real-time effects performance when Final Cut is not having to send a video stream through Firewire. In demanding situations, like when you’re layering a lot of filters, or doing compositing or multicam work, there might be a time when you want to disable external monitoring for a bit to get maximum performance at certain times, but remember, you can’t accurately grade a show watching the Canvas Window. If you have a single computer monitor, under the View menu, under Video Playback, you can choose “Digital Cinema Desktop Preview – Main” as the monitor destination. Then, to enable output to this device, choose View > External Video > All Frames, or just use the shortcut, Command F12. You can turn off Desktop Preview with command F12, or just hitting the escape key. This option scales the picture up or down to the size of the monitor, so you won’t get a pixel-accurate view of your footage. In terms of brightness, contrast, color and saturation, Digital Cinema Desktop Preview, which I’ll call Cinema Preview, will in most cases be more accurate than the Canvas Window, so if you don’t have an external monitor, you can check your work this way. But Cinema Preview is a a computer signal, not a true broadcast signal, and doesn’t show motion accurately. Interlaced footage plays at the frame rate, not the field rate, so 60i footage will look like 30p, 50i will look like 25p. Also, individual frames could blur over several frames, and, some larger graphics won’t display properly. So it’s not a great monitor, but, in a pinch, IF you can calibrate your computer monitor to be pretty accurate, you COULD get by with Cinema Preview, especially for less important projects. Of course, you won’t be able to see Final Cut Pro while using Cinema Preview, but you can still shuttle with J, K and L, start and stop with the spacebar, and set in and out points. If you have two computer monitors, you have some additional Cinema Preview options. The one called “Digital Cinema Desktop Preview – Full Screen” is just like the main one- but on a second monitor- it scales the video up or down to fill the screen. This could be a good client monitor option. If your monitor is bigger than your footage, the one named simply “Digital Cinema Desktop Preview” is better than Full Screen because it won’t scale the picture up. So you’ll see almost a pixel for pixel view- except this option WILL adjust for aspect ratio, so, for HDV for example, it’ll stretch 1440 pixels to span 1920 monitor pixels. If your monitor is smaller than your footage, it’ll be scaled down. If you don’t have a real monitor, this option is the best overall choice for color grading. The option called “Digital Cinema Desktop Preview – Raw” is the most accurate- it’ll always show a pixel-for-pixel image without scaling or correcting for aspect ratio. If your monitor is big enough so that this image will fit, this is a great solution to see how your special effects, keying, or compositing work is coming out, since you’re seeing a pixel-accurate view. It’s fine for color grading too, but might look weird due to a non-corrected aspect ratio. Now, some LCD and plasma TVs have digital connections, like DVI or HDMI, but if you’re driving them from Cinema Preview they’re acting as a second computer monitor- and not as a TV, so they’re not necessarily any more accurate than a computer monitor. This is the typical professional standard def monitoring system used since the beginning of the DV age, and an excellent setup for color grading, whether you’re shooting SD or HD. In this setup, a Firewire cable is connected from your computer to a DV or HDV camcorder, then an S-video cable from the output of the camcorder to a professional Standard Definition monitor. Instead of a camcorder, you could also use a DV or HDV deck, or a dedicated box, but there’s rarely a good reason to spend extra money on this component, since translating digital to analog puts almost no wear on your camcorder at all. Once the device is powered on, and set to VTR mode if a camcorder, under the View menu, refresh A/V devices, then choose Video Playback > Apple Firewire NTSC 720 by 480. When playing video, Final Cut Pro will send a standard definition digital video signal through the Firewire cable that the camcorder will convert to analog and drive the monitor live from the timeline. DV footage has always worked this way, and starting with version 6, Final Cut Pro has the ability to downconvert HDV on the fly and send a DV compatible signal through Firewire. When paused, Final Cut will send a single frame through Firewire, showing both fields at once if editing an interlaced format. This’ll cause still frames with motion to jitter, which looks weird and has caused some concern with new editors, but this jitter won’t be visible to your viewers, only to you in your studio on a paused frame. We’ll talk a lot about interlacing in just a little bit. A professional CRT monitor has a blue only switch that routes the blue signal to all three guns, which is an essential part of the calibration process. There are some low end pro monitors that don’t have a blue only switch, but if you have the right controls you can still calibrate the monitor while looking through a pure blue lighting gel or a blue photographic filter. Another benefit is that you can use this monitor on set for a safety monitor. Even if you’re shooting HD, a professional HD camcorder will output a standard def signal to a monitor like this, and it’s surely more accurate than your viewfinder! The downside is, since the monitor is not Hi Def, it’s not as good for HD computer graphics, compositing or keying because you’re watching a downsampled, standard definition picture. However, a combination of an SD monitor for color grading, and Digital Cinema Desktop Preview – Raw, for pixel accuracy, is a great and affordable monitor combination and strategy. The first is that you probably will not be able to properly calibrate the TV due to a lack of controls, or maybe it seems like you have the controls but you just can’t get the display fully calibrated. No TV I’ve ever heard of has a blue-gun only switch, so you’ll need to do the blue gel or filter trick for the first part of the calibration process. But the worst part is that many TVs have circuitry that automatically adjust brightness and contrast, and sometimes even saturation, depending on the S-Video input signal. This means if you use a TV for your color grading monitor, it might be fighting your adjustments- meaning if you darken your image a little, the TV might try and compensate by brightening the image up, so you’re not getting accurate visual feedback of the adjustments you’re making. That’s why TVs are generally not as good as professional studio monitors for color grading. But they’re still better than the Canvas window! The best option for monitoring HD is a professional, calibrated high definition studio monitor that can display native 720p, 1080i and 1080p up to 60 fields per second. Although they’ll keep coming down in price, pro HD monitors are still, very expensive. To drive a professional HD monitor, you’ll need a third party solution like a PCI card and cable or breakout box system from a company like BlackMagic Designs, Aja, or others which output an HD signal through component or HD-SDI connections to drive the monitor. A Hi Def, professional CRT won’t have pixel-for-pixel monitoring, but will still give you an excellent idea of how your computer graphics will look in any output medium. Plus, if you can afford one of these surely you can afford a large LCD monitor for monitoring graphics. The main drawback is the cost- today, high definition professional monitors cost thousands on the low end and tens of thousands on the high end. This is the new age, affordable way to monitor an HD broadcast signal- by getting an inexpensive card with HDMI or analog component outputs which feed an HD LCD TV. The lines between flat panel TVs and computer monitors are being blurred more every day a display comes out with computer inputs like DVI and VGA, but also video inputs like component, HMDI, S-video and composite. A component/HDMI card and the monitor, today, can be purchased for well under a thousand dollars. Some of these LCD monitors, even the ones with video inputs, don’t auto-adjust like TVs, so if they can be properly calibrated, they make a very good solution for monitoring HD. And, after all, your viewers are more likely to be watching on LCD or similar technology in the future, so it makes sense to grade your show so it looks its best on LCD. And, they can be used on the set for a pixel-accurate field monitor. Tip: In general, I prefer LCDs over plasmas because many plasma screens can’t resolve very dark shades of grey, and simply crush shadow areas to black. If your monitor crushes shadows, you might not see detail in shadow areas, like the boom mic dipping into a shot, but your viewers might! So make sure your monitor has good shadow detail. Can you give a few examples of LCD TV’s that can be calibrated as described in Monitoring option #7 ? All LCD TVs have some sort of calibration, usually brightness/contrast/tint/saturation. With the blue gel or filter trick you can try a pro calibration, it won’t be 100% official but you may get close. The BenQ we have is close… hard to say how close. Is a calibrate profil made with device like Pantone Huey or stuff like that is good for video. I know for photos this is an obligation but s it efficient for video too? I’m just wondering if you have any updates to your HD monitoring ideas. I’m considering buying the AJA Kona 3 card, but like your idea of the Blackmagic Intensity Pro and an LCD. Our project is HDV, brought in via firewire to FCP 6, but we want a nice HD output, as well as being able to color correct. Any updates would be greatly appreciated. I’m interested in #7 as well. I’ve been looking for a good way to monitor my HD editing on an external monitor. I’ve been looking at the Blackmagic Decklink HD, and the Blackmagic HD Link Pro for monitoring straight from my camera while shooting. Do I only need one over the other? And do you have any suggestions on good HD LCD monitors? Which camera are you shooting with ? Does it have component, HD-SDI or HDMI output? With some cards and connections you can loop the signal through the computer and out to the monitor. I have 1920X1080 LCD with HDMI and I have Canon HV20 with HDMI. I use FCP 6. Question: Do I still have to have Blackmagic or AJA? If so, why? I am using Final Cut Pro Academic and using dual monitors for edit (Apple 20″ Cinema + HP 8220 : 1680×1050). I am also outputting VIA firewire to a Panasonic PV-GS120 consumer DV camcorder to preview my final product on a Sony Trinitron monitor. I am curious why I can only preview my timeline (my “Canvas Screen”) in Final Cut and not my “Viewer Screen” in my external Sony monitor in real time. When I load a motion clip into the “Viewer Screen” and play it, I only see my clip in my “Viewer Screen” and not my Sony Trinitron monitor. All I see in my Sony Monitor is a freeze frame of the selected clip. I’ve looked all over to find a setting adjustment with no luck. My only remedy is to create a NEW sequence and play the clip I need to see in my external monitor. FYI – I only do this to check mainly color but also overexposure. Any help would be greatly appreciated. What format are your clips? And what format is your timeline? It sounds like you may have a mismatch. Can you recommend a small HDTV that can monitor while editing for color correction purposes? become a TV monitor. We have G-5 macs ( most updated ) and Apple cinema displays. Super-informative site! I am loving it!! Will come back again – taking you feeds also, Thanks.